Drinking the juice is going pretty slowly again today. At this point, there is no conflict between breaking the cleanse (per the Day 3 instructions in Master Cleanser) and participating in FullyRaw Kristina’s 21-Day Challenge — orange juice for breakfast, raw fruit for lunch, and raw fruit or veggie salad for dinner. I feel like I have been anticipating this day forever! I combined 2 pints blackberries, 1 lb. 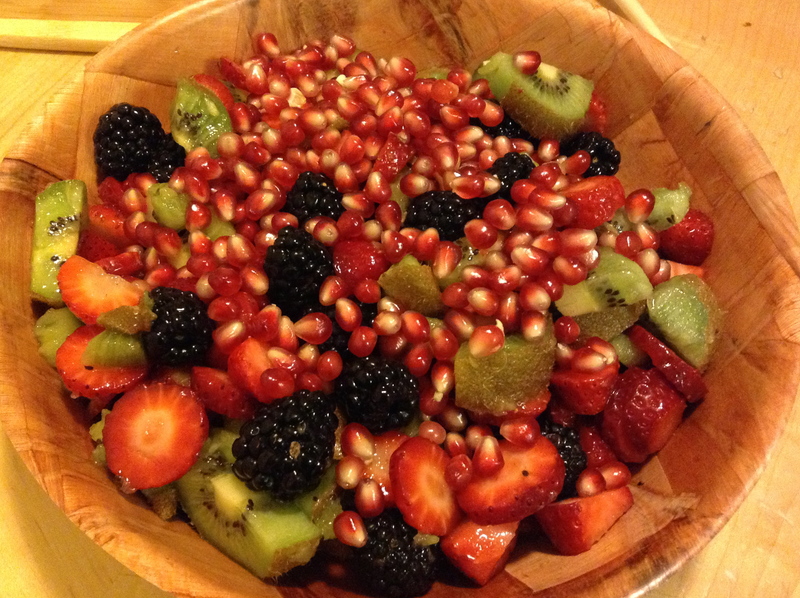 strawberries, 5 kiwis, and a pom. So, I have a good 7 cups of fruit for lunch. According to cron-o-meter, it is an 837.3 calorie meal! I’ll probably be working on it ’til dinner! Lunch is supposed to be 700 to 800 calories, so I’m well in the clear. 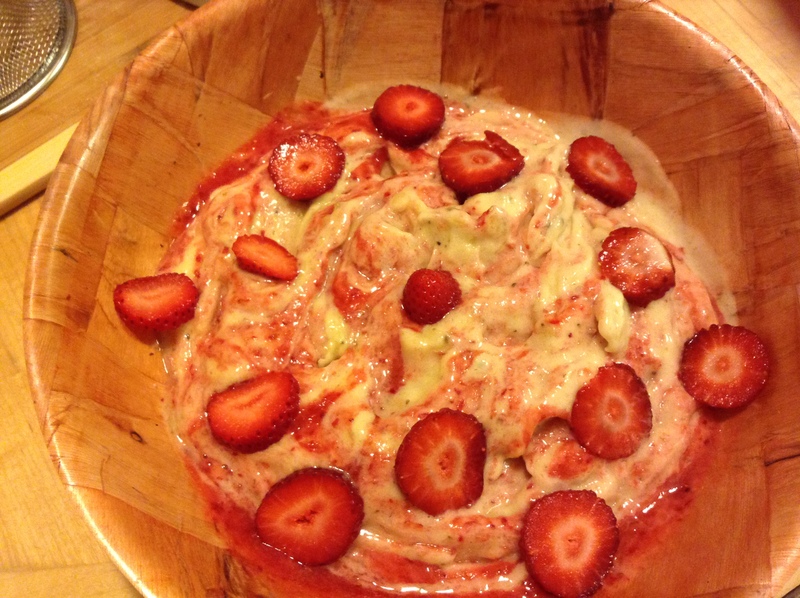 For dinner, I started with banana ice cream and strawberries. Yums! 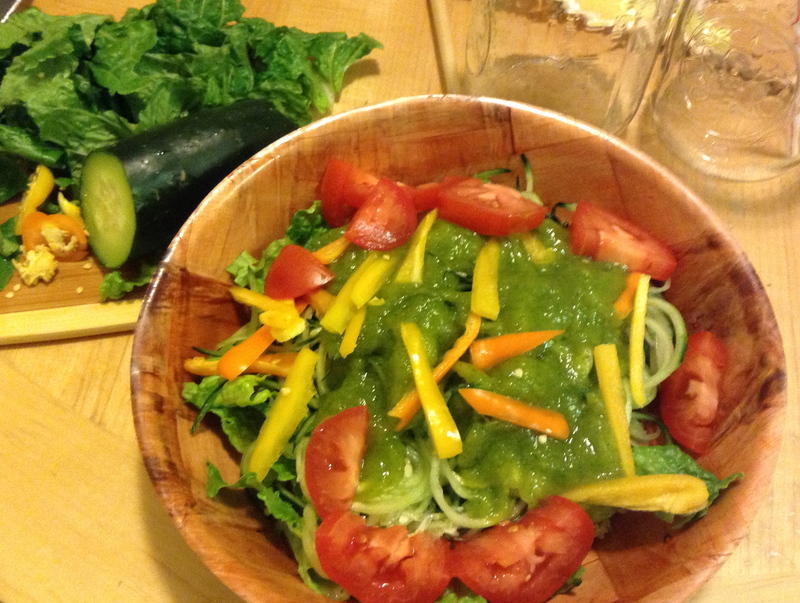 And finished with a low-fat raw vegan (LFRV) dish of lettuce, cucumber noodles, and a papaya dressing. The recipe is from RawsomeHealthy. The dressing turned out greener than I expected, but it was soo delicious! Double yums!! Eating went very well today. I maybe had a cup or less of fruit leftover from lunch. That’s fine, considering the fruit totally filled my 7-cup container, which I packed for the work day. So, I’m glad I ate that much. Lunch? Dinner? Ate all of it!! Those look great! How’s the Raw challenge? Energy boost? Thank you!! The challenge is going great! My energy is stable and “clean”, like pure energy. I feel very alert and clear all the time.